Published on January 10, 2014 in General T&T, Media and Passed on. 1 Comment Tags: Newsday, Stephen Kangal. 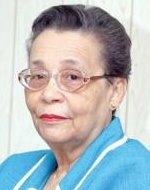 It is with a very heavy but grateful heart that I pay my last farewell to the late Editor-In-Chief of the Newsday, Therese Mills, on her being called in the fullness of time to the great beyond to be with her God after having served humanity notably the small man with a warm and caring heart to the fullest. The late iconic hero, Therese Mills was the tender loving and gifted lamb that made, forged and fashioned me into a civic journalist. In 2002 she gave me an editorial opportunity by publishing my first Newsday article entitled ”Caroni is more than Sugar”. Hundreds of articles followed from this inspiring and motivating gesture.